Many thanks to volunteers Cal and Jack for helping Fred get this news typed up back in February 2014. 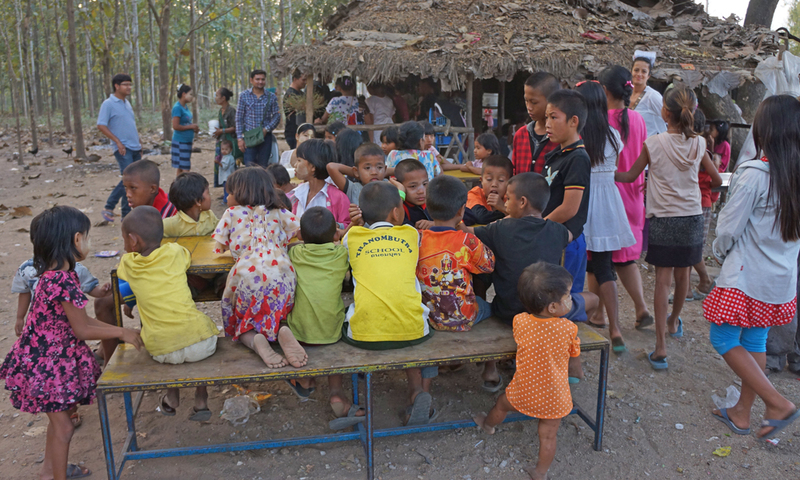 I departed Ashland, Oregon, [October 2013], and returned to the Mae Sot dump. After only a week of being back, I noticed there was a lot of disharmony in the community, which occasionally happens. It’s not an easy life for these people, as they have a lot to put up with. I felt like I wanted to do something to bring the community back together as a whole. One of the best things we could do was to set up a party. Setting up for the party is a huge effort, and requires the whole community to get involved and working together to find pots, pans, table and chairs which come from the monastery, school, and all over the place. 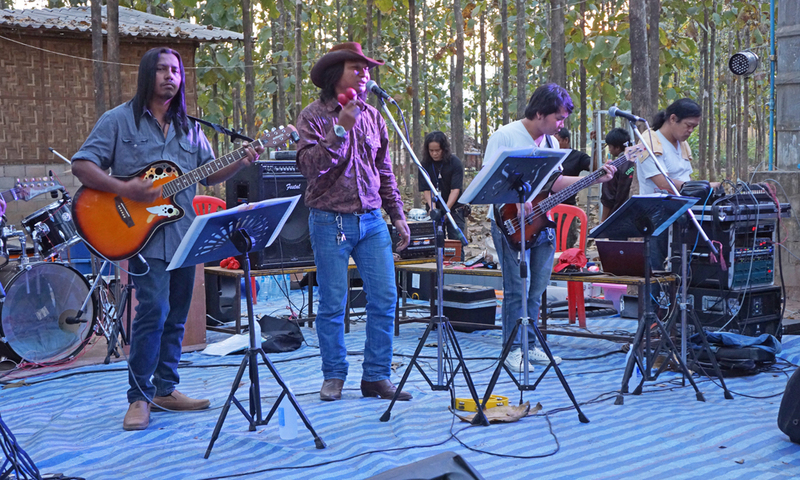 Back in town there’s a local Burmese rock band. The owner was an acquaintance of mine, so I asked him if he was willing to put on a gig at the dump. He was happy to put on a show, and made plans to arrive and set up at the dump. That Saturday they arrived with two trucks with their equipment- speakers, lights, seven piece band, the works. The band was extremely professional and eager to set up and get to work. By 5:30pm they were set up, and ready to go. After about 30 minutes of playing, the crowd was still quite small, but people were slowly trickling in. People were standing around, watching and looking, but didn’t seem to grasp what was happening. Then I realized, as I’ve seen before, because this has never happened, no one knew how to respond to their performance. 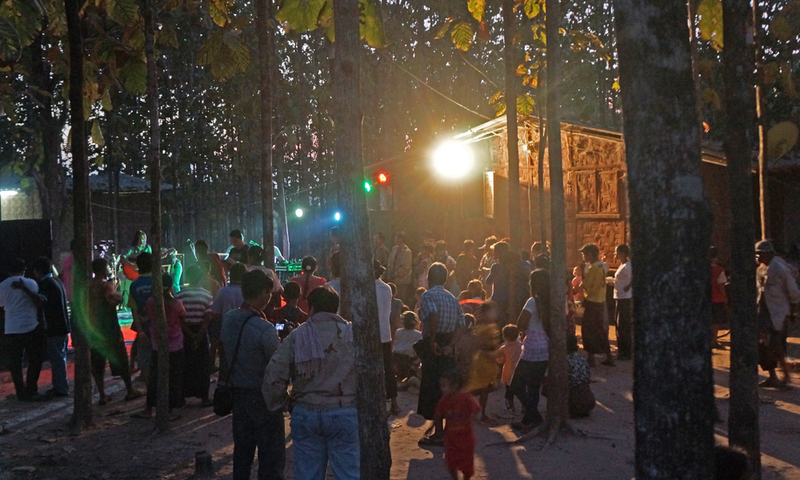 Fortunately after about an hour, the sun went down, the lights were flashing, and people really started to get into and enjoy the rock band. By the end of the night everyone was dancing and having a blast. Weeks after their performance, the community were still discussing the night. It was clear that the event was a big hit, and was successful at bringing the community together. Nowadays people continue to ask me when the next performance will be. Joe now teaches community music and computer lessons at the dump! Click here to watch the Music Project story.